A beautiful 6.23-inch Super Full Screen with numerous software assistant for better full screen experience. 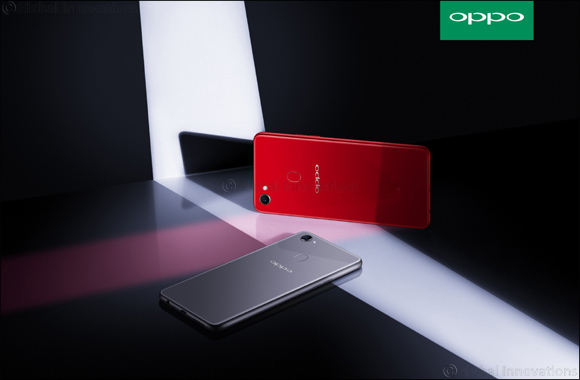 Dubai – United Arab Emirates, 23rd, April 2018 – OPPO, the Selfie Expert and Leader, today launched the F7. The latest Selfie Expert, powered by Artificial Intelligence (AI), takes smartphone technology to new heights. Together with the Super Full Screen and glossy design, the F7 offers consumers a better user experience. Priced at AED1249, the OPPO F7 with 4GB RAM and 64 GB ROM will be available from April 23rd, 2018 on all online and offline stores in Solar Red, Moonlight Silver and Diamond Black. OPPO will also hit the market with F7 128GB edition in Solar Red and Diamond Black color priced at AED1599. OPPO also announced its global expansion plans at the launch event. The brand will be entering European markets later this year. “Our focus has always been on bringing the best photography and selfie experience to the Middle East consumers. We have been leading the selfie industry in the Middle East market with our Selfie Expert F series for which we have received immense response, especially from the youth. With the launch of F7 here, we will further strengthen our stance as ‘The Selfie Expert and Leader’ and truly represent our ambition to continue being the leaders in the market.” said Andy Shi, Manager Director of OPPO Africa and Middle East. F7 is the first smartphone equipped with a 25 MP selfie camera in the industry and also the first phone using Sony 576 Sensor with a HDR (High Dynamic Range) function in hardware (Sensor HDR). Because the HDR is in hardware, users can get exactly the same photos as what they see in the preview. Also thank to Sensor HDR, real-time adjustment will be initialized every time the light condition is changing thus helps the selfie camera capture more details for better imaging effect. Even in backlight condition, person and the background will look clear and detailed. The AI Beauty 2.0 scans 296 facial recognition points which include arm and neck based on a person’s age, gender, skin color and skin type. It is 20% improvement from the predecessor F5 allowing for a more precise and accurate facial recognition capability. F7’s AI Beauty 2.0 now has 8 million beautification solutions from global users compared to only 2 million in the F5. Having such a big database means it can intelligently provide the most suitable beautification for each people. AI Beauty 2.0 also creates a unique algorithm for various facial zones such as eyes, noses, cheeks and forehead. With the enhanced facial beautification, user’s skin appears more moisturized and eyes are shinier with minimal shadow between the nose bridge. This makes the face naturally beautiful. AI Beauty 2.0 also specifically optimize beautification for group selfies and it provides different beautification for the various people in one frame. It supports a maximum of 4 people. The AI beautification learns constantly. The AI in AI Beauty 2.0 learns user’s editing habits and create customized beautification solution for this user. The more selfies user edit, the more AI learns and the more customized AI selfies it creates. Interesting features like vivid mode and AR stickers are also built into the AI Beauty 2.0. Vivid Mode gives the user the opportunity to play with an enhanced background color saturation but still remain a nature face. While the AR (Augmented Reality) Stickers function allows you to have fun with selfies, adding cute animal or movie star like features, ready for social media sharing. The F7 comes with an improved 2280 x 1080 resolution, 6.23-inch FHD+ Super Full Screen. With 19:9 aspect ratio and 88% screen to body ration, the screen gives a much more colorful, vivid and immersive visual experience. Accompanying the Super Full Screen is a series of numerous software assistant for better full screen experience. For example, The full screen multitasking can hold app icons or notification bubbles, so you can still read and reply to messages without interrupting your games or videos, as they go app-in-app. The design of F7 follows unique color aesthetics of OPPO which integrate young and fashionable elements. Users have three different color choices to suit their personality - Solar Red and Moonlight Silver, and special Diamond Black edition. The F7 also offers greater integrity of glassy materials. It shines with different light refractions, allowing the imagination of our users to go wild. F7 has also been equipped with a 3400 mAh power cell. According to simulated test in the lab, users can keep listen to music uninterruptedly for more than 33.5 hours, watching videos for 13.4 hours and playing games for 8.3 hours. Besides long battery endurance, F7 also utilizes a smart AI battery management system that prevents unnecessary drainage. The AI manager will learn and establish the user’s usage patterns and habits over time, and eventually manages power for optimal use. The system will snooze or freeze inactive apps when it’s appropriate, so that there’ll be more power for more productive tasks during the user’s day. The F7 comes with a brand-new, very much enhanced ColorOS 5.0. It is based on the Android 8.1 and has AI inbuilt into it. ColorOS 5.0 comes with a brand-new design that is easy on the eyes and it also strengthened safety feature with Safe box, app hiding and various unlock ways. The OPPO F7 will also be available at independent retailers in the UAE.